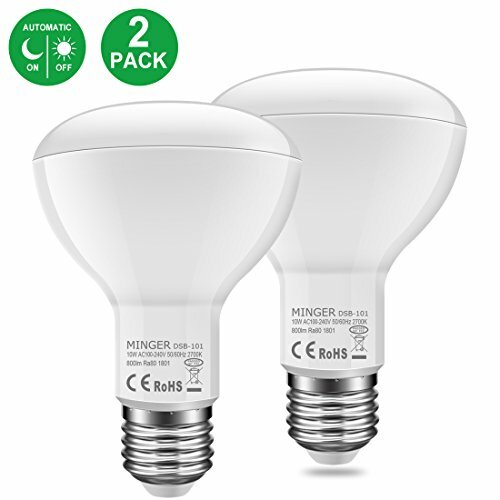 MINGER 10W Dusk to Dawn BR30 LED Bulb Light, Auto Turn On Off, 60W Equivalent, 800 Lumens Soft White 2700K, E27 Base, 120°Beam Angle Spotlight, for Indoor and Outdoor 2 Pack by MINGER at Defy Now. MPN: H6012912-MG. Hurry! Limited time offer. Offer valid only while supplies last. Product Benefits: MINGER BR30 LED flood light bulbs provide 800 lumens of soft white, equivalent to 60-watt incandescents with 80% less energy use. MINGER BR30 LED flood light bulbs provide 800 lumens of soft white, equivalent to 60-watt incandescents with 80% less energy use. [Energy Saving] Built-in photosensitive elements, automatic sensor control. Save 80% of energy than traditional bulbs. It automatically switches On at dusk and OFF at dawn.Replace a 60W traditional light bulb by a 10W LED. Turn off > 45Lux, turn on <15Lux. [Easy to Use] Simply screw into any standard E26/27 light socket or fixture, no wires or additional motion detection Fixtures required. [Warm White 3000K] AC100-240V, 900lm. Light up your room and your mood. [High Quality LED Chip] Each bulb is with 32 SMD 2835. Bright, environmental friendly, wide voltage constant current power supply. Light brightness will not change. No radiation, no flicker, no electromagnetic waves, no harm to your health. [Versatile Application] Widely used in the home indoor lighting, hotel, meeting room,, offices, hospital, schools, factories, museum, shopping malls, supermarkets, restaurants or any other places where accent lighting is required.